When I wrote my piece about the Benson memorial windows in the Royal Shakespeare Theatre, I received a comment about the memorial to Bensonian actor Frank Rodney that stands in Holy Trinity Church. Stratford’s Church probably contains more memorials to actors than most, but Frank Rodney is not a famous name and his memorial doesn’t even get a mention in Val Horsler’s recent book Shakespeare’s Church. Rodney had performed in Benson’s Company from 1895, and was one of the most talented of the actors in it. His Oberon was noted for his “cold silver enunciation”. Many years later the great critic James Agate wrote “He was the best Clarence, Buckingham, Bolingbroke, Iago and Mercutio that I have ever seen”. Ursula Bloom’s book Rosemary for Stratford-on-Avon is an affectionate look back at the town near which she lived as a child, written after she had become a popualr novelist. Bloom writes about the night on which the great actress Ellen Terry came to the Memorial Theatre to play the Queen in Henry VIII on 23 April 1902. Although Terry’s performance was hotly anticipated, it was in some ways Frank Rodney’s night. He was one of the most popular actors in the regular Benson company, but had been ill, and he had recently been diagnosed with cancer of the tongue. He was to undergo surgery which, at best, would reduce his ability to speak. Everybody in the theatre knew that even if the operation was successful this would be the last time they would hear him, and the place was packed. 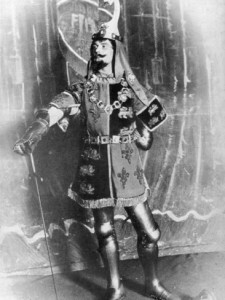 In the play Buckingham faces execution, and Ursula Bloom reports that the audience “went deadly silent when Frank Rodney came forward playing the part of a man on the road to death”. The Stratford-on-Avon News, on 8 May, reported “The painful circumstances give a particular pathos to the Duke of Buckingham’s fine speech. Mr Rodney delivered it with much feeling and with more than the usual emphasis… At the close of the scene he was called before the curtain and met with such a reception as he will probably never forget. The audience loudly cheered him and called him back three or four times.” He was called for again at the end of the play, but the actor was so overcome that he had already left the theatre. Very sadly the operation did not cure Rodney and he died in Southampton on August 14 1902. He was mourned not only by the Benson Company, but also by Stratfordians. A memorial within Shakespeare’s church was welcomed for this much-loved man. 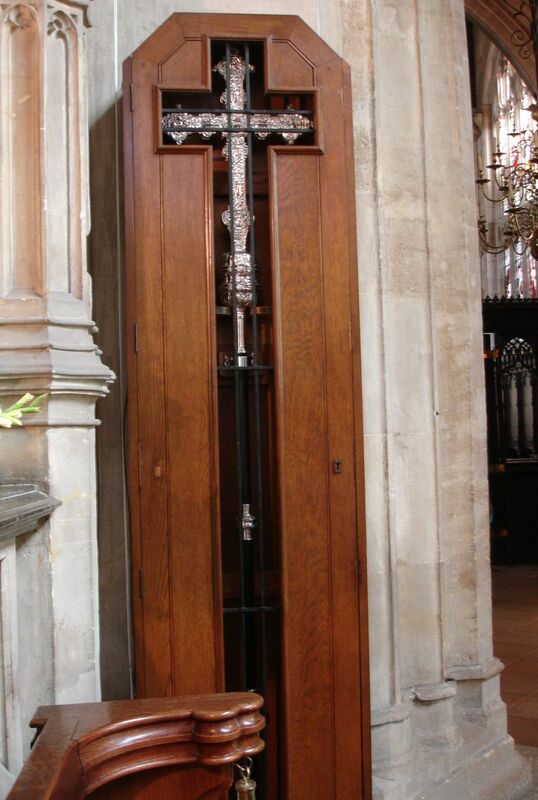 Paid for by ex-colleagues and family, the beautiful silver processional cross was the result. 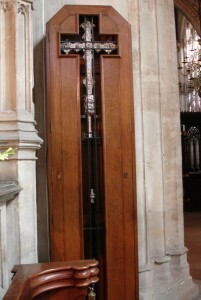 This is still to be seen in its case near the choir stalls, sometimes in use during services. It is decorated with words from the speech quoted above. For my connection with the cross let’s go back to Ursula Bloom. William Tompkins was my grandfather, and this photograph shows him holding the cross outside the church. Years later my father showed me the cross and told me the story of Frank Rodney, one of the most notable of the Bensonians, who, had he lived, would have been a famous interpreter of Shakespeare’s characters. This entry was posted in Shakespeare on Stage, Stratford-upon-Avon and tagged Benson Windows, Ellen Terry, Frank Rodney, Henry VIII, Holy Trinity Church. Bookmark the permalink. 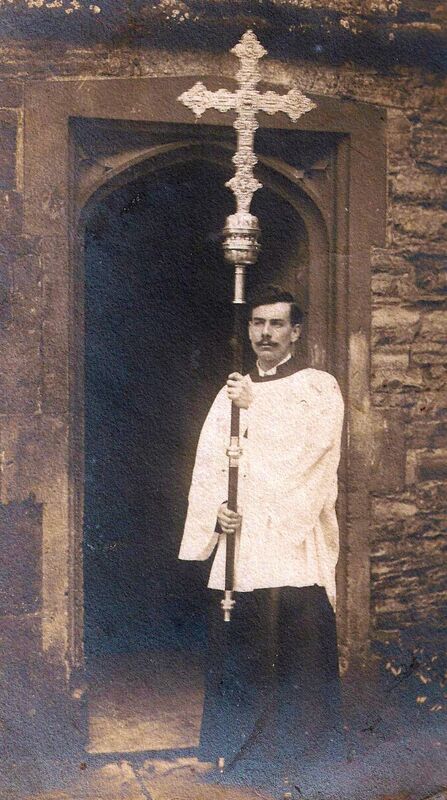 While your grandfather bore the cross, you carry the torch, and we’re so thankful for it. Your blog is always the highlight of my day! Corisa, Thanks for these kind words! I don’t know where you come from, but I do enjoy being in touch with Shakespeare-lovers round the world. Beautiful Sylvia, I didn’t know the story of Frank Rodney. A very moving story, and a wonderful connection down the years. I echo the previous comment, your blog posts are a delight. Many thanks Jan. I’m glad you enjoy the posts! I’m related to Rodney, my Grandad’s middle name was Stratton, named after Frank’s brother. I know very little about him, but have gone to see the cross several times. Thank you for this article, it’s very interesting to learn more about him! Thanks for your comment, and how interesting that you’re related to Frank Rodney. He was a great loss to the British stage. Thanks for this information, Brian!